Whether or not you’re back in school (don’t hate me, but I still have another week off! ), there’s always room to do a bit of extracurricular reading. And what better subject than fashion? 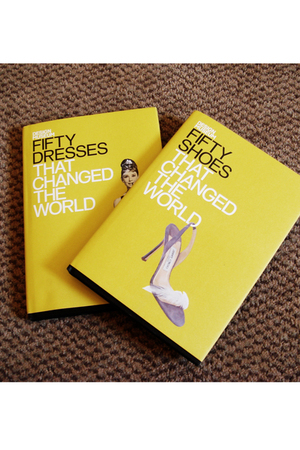 So over break, my reading material included Fifty Dresses that Changed the World and Fifty Shoes that Changed the World. Covering iconic designs from the 1830s to 2008, the two books show the progression of fashion by discussing what their titles would suggest: Fifty iconic dress and shoe designs. While many of the selections will be familiar to you Chictopians, such as the little black dress and ballet flats, others will likely be new or unexpected to even the most seasoned fashion veteran, like the Vivo barefoot shoe or Wallis Simpson’s wedding dress. My only issue with the books is that their endings are forcibly entrenched in an old-school sci-fi idea of futurism. The final dress and shoes that are highlighted are the Hussein Chalayan LED dress and the Zaha Hadid x Melissa shoes, with other similar selections in the previous pages. Certainly, they are notable designs (I gasped at that entire Hussein Chalayan collection), but with these endings, the books seem to suggest that this is where the future of fashion is headed. Many of the older designs in the books are iconic due to their prevalence in the streetstyle of their times. To break that theme and imply that we will wearing rubber shoes (well… Crocs, perhaps, but they can hardly be considered shoes) and lite-brite dresses is just confusing and woefully cliché. Still, these books are more design-focused than fashion trend oriented, and bring up a good point: As we gather more and more vintage inspiration, is it possible that we’ve left ingenuity and novel designs behind? Has everything that can be done (in terms of dresses and shoes at least) been done? What do you think? thanks for sharing these..i need to find out how i can get my hands on them! love audrey! need to get these! love it! and i got these books for Christmas!! Honestly, everything hasn't been done. Everyday people are coming up with more and more ideas for cuts and styles. I think that when we see something different from what has been done in the past, automatically we want to question it and not give it recognition. however, maybe the future will be more receptive of new ideas and concepts as far as clothing is concerned.